10 Best Mobile Wallets in India to make transactions faster, safer and save some money. Online Payment System makes the business world go round. In India, the expansion of e-commerce is made possible due to the launch of online payment gateway and online mobile wallets in India. The process of moving the works on stream initiates with observing the ins and outs of e-commerce. Online payment wallet or e-commerce payment system simplifies the transaction by the electronic payment through some gadgets. When the system is being provided by the online service there likely some convenience level to accept the electronic payment.The organization can accept the payments through credit card/debit card, where it is decided to be the comfort of the business. Payment through online will be more secure and convenient to the customer. Here they can pay for the goods and services at rapid scale, where we won’t realize the background work which is being done. A Merchant account – but some payment systems (such as PayPal) does not need a merchant account. An account with online payment gateway provider. A website includes buy button (e.g. Join, Donate, Buy) that starts the transfer work. The card is keyed at the merchant. Data is sent by the merchant to the processor, which is usually a bank. Transaction reaches card holder’s issuing bank. Approve/ Decline sent bank through the network to the seller to complete the purchase. Acquiring bank settles with issuing bank. Acquiring bank settles with the merchant. For the purpose of changing the whole public sector through the use of evolving technologies, the Government of India has introduced the Digital India programme with the motivation to transform India into a digitally strengthen in society by using advanced and evolving technologies. Digital Technologies which include Cloud Computing and Mobile Applications have raised as motivation for fast economic development and citizen welfare across the network. which is focused on technological mobile usage development. The projects were focused on citizen-centric which will have good advancement in the future. The mobile device can do billions of bundled work including payments, transactions, purchasing but in a secure manner. The mobile Industry has multiple distribution networks where the cashless transaction is enabled via ATM (Credit/ Debit cards), Internet banking. As purchasing method is varying day by day, the payment platform and payment gateway that follows the former. Mobile point of selling machine have been present till now. The usage of mobile wallets in India is the new motto, that has strengthened the use of Credit cards and it slowly replacing the old transaction and purchasing method. In other words, Virtual Mobile wallet where one can unparalleled subscription. Digital wallets also come with users interesting deals like advancements, cash back offers, and maintain history of your account frequently. Avoid highly expensive transaction fees when you roam around. 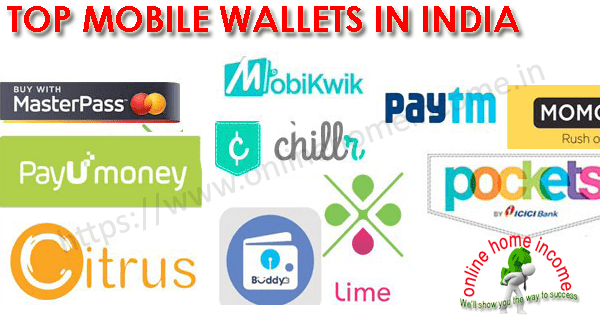 Here is the list of best digital wallet for all your online transactions including bill payments, DTH Recharge etc. The self-declared merchants – Bank to Wallet transaction and vice-versa. The security feature includes only the users Paytm with Id and its password will allow using the Paytm online payment wallet. If someone try some malpractice it will ask for OTP, where they can’t hack the wallet application. Mobile application Lock password: You can set the phones usual screen lock/passcode/ pattern/ pin/ voice lock as your PayTM lock, where it will ask to reconfirm those while using the wallet to avoid unauthorized access. The transaction fees for PayTM to the bank account is 0%, similarly Paytm mobile wallet to the other wallet transaction charge is also 0% for lifetime. Refund and transaction to the bank details will cause some delay but by using online payment wallet in this application will do it instantly. Some other benefits include Passbook where you can check all the transaction details done by the app. Individual Personnel QR code for the safe and secure transaction. The offer tab and recently launched list details intended to be displayed for regular updates. You can able to see where and whom you are buying the products from and the reviews, rating of the particular products before getting it. PayUmoney is an Online Payment solution, which is the mobile-based online payment solution. Their main aim is to bring cashless payment through the use of mobile wallets in India. Encourages the use of Credit/ Debit card payments, Net banking for anything by the use of Mobile app without even Swiping Machine. The salient feature of this digital wallet includes, it does not need a merchant to install any hardware. The mobile app allows typing the offers in a search URL to the Users using their unique id’s. The application also scans the QR code to search the favorites of the user. Some of the benefits of using PayU application includes zero setup cost, No documents needed for collecting payments. MobiKwik is the one of India’s best self-governing mobile payment network, which allows you to shop your favorite shopping area, payment of bills, recharge, transaction process at one tap. MobiKwik is much easier than other mobile apps, RBI certified using multiple layer technic for detecting the fraudlaunts. Similar to that on Mobile Banking. MobiKwik is used in every small to the huge payments for Mobile, DTH, Data Cards, Landline, Electricity, Cooking Gas, Insurance. Transfer money from bank account. Send money to the other bank. Request for money from the contacts. Can also check for the transaction pending. By referring MobiKwik to the friend and you can earn up to Rs. 1000 and use this life-saving application. For every 3rd recharge or payment of the bill, you will get 10% cashback offer. 5% cashback for train ticket booking on IRCTC transactions. Cashback of Rs. 100 on the first bus ticket booking. These offers are not stable where it will change over for the time being. There are many other similar online money making apps available in India. Momoe is the developing company located in Bangalore whose vision is to bring rapid change in online payment gateway and build a good bridge between the customer at the real world outlet such as grocery, medical store etc., from the small place till the big business. Enabling the payment through the mobile phones with the mobile application which will be more comfortable for the customers. The payment is also possible by credit card and debit card by Mobile Application with MOMOE. Dine in Restaurants: In most of the restaurant, the order can be done in the live tab, by using this online payment wallet you can pay and leave the place when you wish. Splitting of the bill is also possible. Once the payment is done successfully the notification will be received. The advantages include Instant checkout, Split your bill, Wide network, Rewards and credits, Offers. It is quite simple and safer application to use. All the data in this application are being encrypted by using 128 bit SSL. You view your bill of any kind by using this application. No frustration will appear. Citrus is the fast-growing online payment solution. The application offers One Tap transaction, Payment provider, and other aspects. The payment can be made during dinner, movies, parties, and where the bill can be split among friends. With the one tap system, they can compete with MobiKwik. The citrus digital wallet is currently growing as a top mobile wallet in India with online payments like Cafe day, PVR cinemas, Ixigo, Meru cabs, Ticket new, Inox, Faasos and more. The citrus wallet is easy to use. Wallet allows the user to seamlessly transact the parented dealer. Instantly refund the online purchase in case of failure. In specific the best deal of the products includes apparel, entertainment, movies, etc. SBI Buddy is one the best and first Online Payment wallet on mobile phones. This mobile wallet is specifically designed for the prepaid application which can be used for the dealer application for the transaction which is being flexible at time and place. It is the semi-closed wallet to transfer the money safely. The main and unique feature of this application is it has reminder schedule to settle the due amount, payment of bills, recharging etc. The SBI buddy is a digital platform where the customer can simply send or ask for money. Add money to your wallet by using a debit card/ net banking/ IMPS. Request for money from any state SBI Buddy and track status of money owned by you and owed to you. Send Money to any of the contacts in your contact list. Transfer money instantly from wallet to any bank account using IMPS. Recharge for mobile/ DTH and pay bills using this mobile app. Buy movie tickets, Online merchant payment, view your Statements. The SBI has its app in 13 languages and also available for non-SBI customers. ICICI BANK is the multi-national banking and financial service. Here user will be able to create a safe and secure payment named iMobile Smart Keys, the unique digital application includes chat, messenger, games and searching option. It is the borderless account, the cheapest currency account for the online seller. ICICI Bank is available everywhere, here the shopping can be done anywhere. It is very comprehensive one. And the transaction limit per account in their digital wallet is limited up to 10,000. Any bank’s debit card can be used. The pocket wallet also comes with the physical purchasing card where shopping can be done anywhere. PROMO CODE is being provided for every offer. Get a McDonald’s free discount card. 50% cashback on the Merchants first transaction through UPI. Likewise, these offers also similarly change at the time period which is not constant always. The City MasterPass is the global Digital mobile wallets in India which have been launched by the integration of Citibank and MasterCard, which introduced the launch of Citi MasterPass. Users will have access to too fast and secure checkout options. The process will reduce the checkout time. It is efficiently more secured. Simple and secure payment in less time. You can add credit/ debit/ prepaid cards from MasterCard, Maestro, American Express, Diner’s Club, Discover, Visa. The security feature or the features which make the application more convenient are the purchase authentication, here the master pass account is only operated by its owner. Data Protection, the data’s are stored more securely and the zero liability protection stops unauthorized access. The Unique feature of the City MasterPass includes Digital shoppers will spend 10x more than their less-digital platform. Wallet helps dealers connect to millions of consumers who are ready to use digital payments through the bank they trust most. Masterpass QR is secure, smart and easy to cash payments. The offer is given through a number of leading banks all over the globe. City master pass is that provide safely pay, face to face purchases. There will be no fees to use the wallet if you opt to receive a notification message. There are discount offers in Burger kings, Cinemax, pizza discount etc. HDFC Bank has introduced it’s UPI digital wallet, it is one of the best online payment wallets. Chiller has been running on IMPS. HDFC chiller is India’s First unparalleled bank mobile app for payment that links directly to your bank detail account. Sending money to your Chiller account at a faster rate. Add customer to chiller using application. Recharge your mobile, DTH, data card, etc. Request for the transaction amount. Scan QR code to pay the bill. Splitting of the bill between friends. The personal information will not be stored in the application. Secured by 2048 client certificate. The process of sending money will be similar to that of sending a text message to someone very simple. Lime Wallet is an internet-based digital wallet, which is the Axis banks third largest private area. Also, allow users to store receipt data. Lime will act as a separate application, which will encounter any individual to share mobile wallets and make seamless peer to peer on the on-stream an offline dealers. Lime will enable the users to open a fully enveloped saving account that will digitally complete the KYC process using online mobile payment. Payment will be simpler to use by credit/debit cards or through net banking. Simple authentication via 4 digit PIN. Shared wallet and Pool money. Transfer money and Split Bills. This mobile application is being used by both account and non-account users or customers can use net banking by credit and debit card details. The particular account holder can share their wallet to the other person in the term of gifts, money etc. Concluding the overall survey includes the order of online payment wallet described here is based on the security, efficiency method, and usage among people. The Mobile Wallet technology will bring the biggest penetration in India. The Major difference between Mobile wallet and online payment includes, the mobile wallet does not need any fee for every transaction. HOSTED: The non-hosted or a direct payment gateway is inside merchant store, here no card information’s are being taken by the merchant. Here security is a most important process. NON HOSTED: Redirect or hosted gateway include the transaction among the customer and the dealer is fully based on the online where the security will be provided in a various way through encryptionetc. will be done at each side, each and every step is being known by the user. The main motive of using mobile wallets in India is to provide a cashless economy with full state protection, reduce tax avoidance. Making electronic payment environment is completely secured so that major crime factors will be minimized. Though to bring our nation into a cashless process is a huge work but there should be some efforts to be taken by every individual to make our nation a well-developed cashless India. It provides access to real-time data. Helps you maintain a progressive edge. Develop the customer experience since the wallets provide fast and secure payment methods. Usage of cellular mobile phones as Mobile wallet will increase the digital payment to go as top market. The demand for digital cash, or coming cashless, is been clear and improving across India. The advantage of the digital usage includes credit/ debit card, online money transfer, usage of wallets for money transfer. But it has a negative end, where the usage of cards in cities is high but in rural India, it’s difficult which is made possible by mobile wallet. The Mobile Wallet is named for its security level. Mobile phones and its selling rate are distributed across India with the highly penetrating environment. Below are the possibilities of using Mobile Wallets in India. Simple to load money – Credit or Debit card details by banking. The range of uses – Multiple usage facilities. Split bill facility- Sharing of money. Ensures timely payment –Auto payment option. Convenient for the users in all the aspects. Lower cost- removes the need for intermediaries.